We love Pad Thai at restaurants, but I always wonder just how much protein is in it. Finally I found a recipe for Pad Thai that has a nice 25 grams of protein per serving yet only 345 calories. I’m in love! Now I can enjoy this guilty pleasure without any guilt at all! Plus there’s all that chewing satisfaction from the whole-wheat pasta. Yum. This is especially fast if you keep cooked shrimp and pre-cooked chicken in the freezer. You can throw this together pretty quickly and you might have these ingredients on hand already. Kids like this too. I can’t count how many win-win-wins this makes. By the way, the original recipe at Prevention did not include bean sprouts or shredded carrots. I like to include them for more of a restaurant experience and they don’t add much in the way of calories. Bean sprouts are a decent source of protein as well as good vitamins, so I consider them a real improvement to the original recipe. 2 teaspoons red chili flakes or to taste–individuals can add these to their plate to get the level of heat they like. Or pass the sriracha sauce at the table for added heat. Cook pasta according to package directions. Toss with the olive oil. In a small bowl, make the peanut butter mixture: stir soy sauce, peanut butter, sugar, chili sauce, chili flakes and water until smooth. Crack eggs into pan and scramble until firm. Add shrimp or chicken and cook for another 2 minutes. Add cooked pasta and peanut butter mixture to pan, tossing with chicken and eggs. Add chopped cilantro. Provide garnishes that people can add to their own taste: extra red pepper flakes, crushed peanuts, bean sprouts, shredded carrots, and lime wedges. Russell that could be really good with the shrimp, but I’d add a little at a time to get the right level. Taste as you go & keep track of how much you added so you can make it more easily next time. Be adventurous! Thanks for stopping by and let us know how it turns out! What are your thoughts on adding fish oil to the sauce for a truly authentic taste? Some of the protein comes from the whole wheat noodles. Maybe use less pasta and more shrimp or chicken? Good luck with that Jose! This looks and sounds yummy! 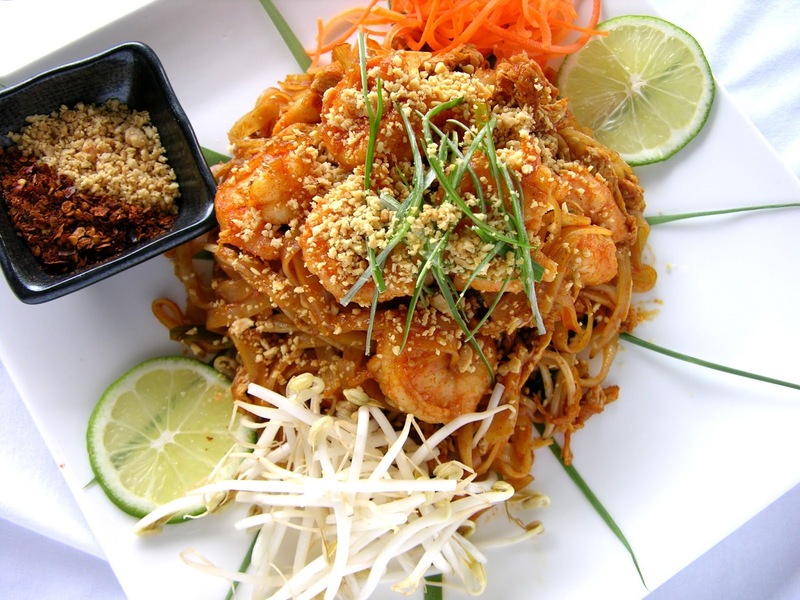 I love Pad Thai and I have to try this out. I’m wondering if I can get away with leaving out the noodles and make it a somewhat low carb entree?